Yesterday a US F/A-18E Super Hornet is reported to have shot down a Syrian Army SU-22 jet near the village of Rasafah, south of Raqqa. Washington claims it was an act of ‘collective self-defense’ because the Syrian jet had dropped bombs “near US-backed forces.” Syrian officials in Damascus deny the US claims, stating that their plane was downed while conducting a strike on an ISIS position. 21WIRE reported earlier this week how the presence of US and UK troops on the ground inside of Syrian sovereign territory may be provoking an escalation of an already tense situation in both Raqqa and in the region around al-Tanf. US-led coalition forces are supposedly there to train and assist ‘anti-ISIS’ militias, but also anti-Assad ‘rebel’ militias too. The US also also trying to impose self-styled ‘deconfliction zones’ around al-Tanf. In recent months, the Syrian Army have been making huge advances against ISIS positions. This latest US attack on Syria indicates that the US do not want the Syrian Army involved in the liberation of Raqqa – presumable to be able to stage-manage and control the operation and media coverage for its global audience, as the US did previously with Mosul in Iraq. A clear pattern has emerged with almost every US strike against Syrian forces inside of Syria – in each and every instance, the main beneficiary appears to be ISIS. 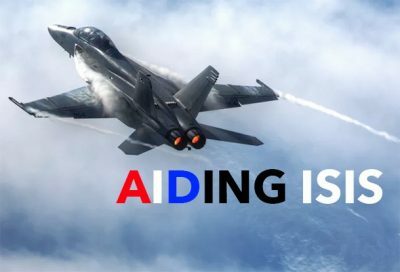 Based on past incidents where US forces have attack Syrian military assets, in each instance the US attacks have benefited ISIS on the ground – leading many to conclude that the US Coalition forces are helping ISIS to gain strategic advantage against the Syria Army on the ground. Back in September 2016, US had attacked and massacred over 80 Syrian military soldiers after a ‘Coalition’ airstrike on Dier Azor – a US attack which allowed ISIS to strategically advance past Syrian Army defensive positions. In addition to aiding ISIS on the ground, this act by the US also ruined any chance of a viable ceasefire agreement with Russia and Syria at the time. A similar events took place on June 5, 2017 when US-led coalition forces attacked what they called “pro-Syrian regime forces” near the town of al Tanf in southeast Syria, claiming the Syrian forces including some 60 troops, had somehow entered what the US claim was a “well-established de-confliction zone.” The US strike helped to take pressure off of a retreating ISIS in the region. In addition to this, the US cruise missile strike Syria’s Sharat airbase near Homs killed some 80 people, supposedly in response to an alleged ;chemical weapons attack at Khan Sheikhoun in Idlib Province. As it stands the US presence in Syria is in violation of both US and International Law.